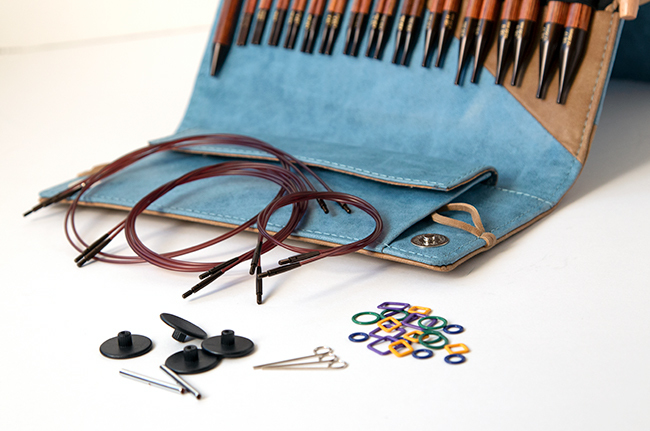 Needles were provided for review by Knitter’s Pride. Opinions are my own. 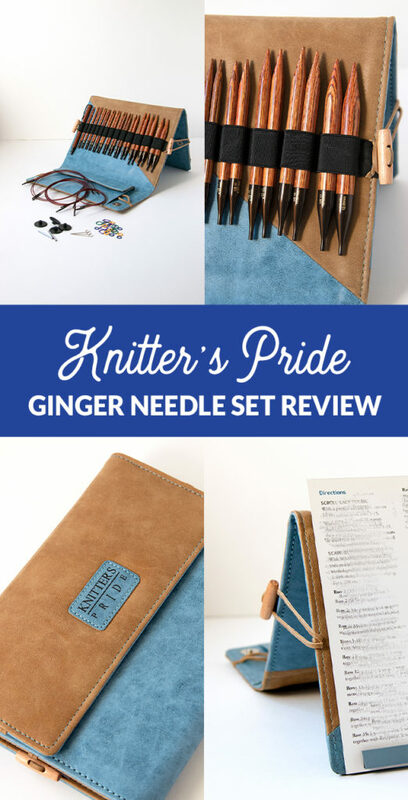 Meet the newest interchangeable knitting needle set from Knitter’s Pride – Ginger! Unsurprisingly, my first thought upon seeing this set of knitting needles in person was, “Ooh, pretty!” because they really are. 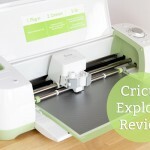 For this review, I took a look at the Ginger Interchangeable Deluxe Circular Needle Set, which has so much going on, but in a good way. 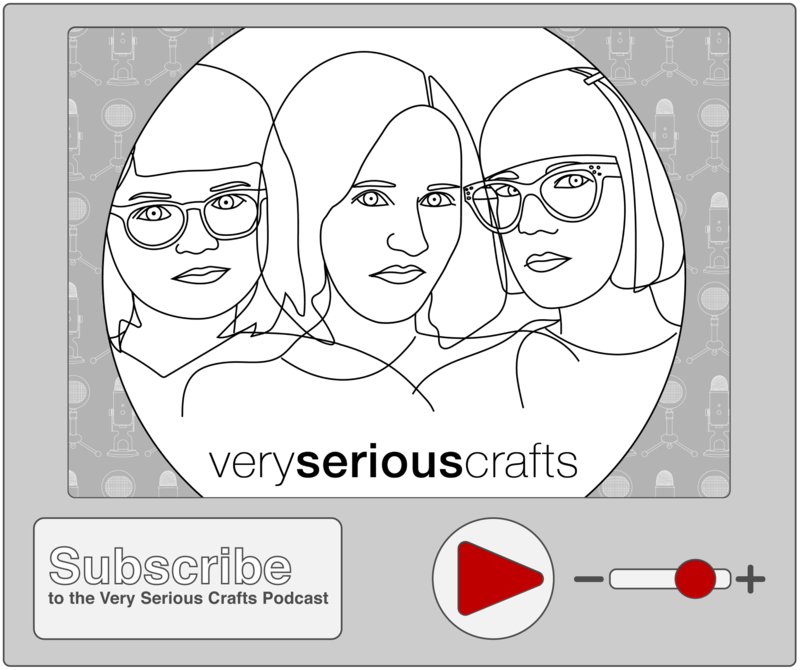 There are 13 needle sizes included, more than mosts sets out there. The beautiful case has a magnetic lining on one side, so it doubles as a pattern/chart holder that makes keeping your place easy as you work. And that’s just the start – keep on scrolling for a closer look & a breakdown of the whole Ginger set! The thing with investing in an interchangeable needle set is that you better like the way the needles feel to work with because you’re about to have the same cords & tips in a BUNCH of sizes. Having knit a bit with this Ginger set so far, I can say that they have an even finish that’s really smooth, the cord-to-tip join (which can be “catchy” on your yarn, depending on the set in question) is smooth, and that wide size range is nice. The pattern pictured above is being used to show the needle set’s chart holder feature. 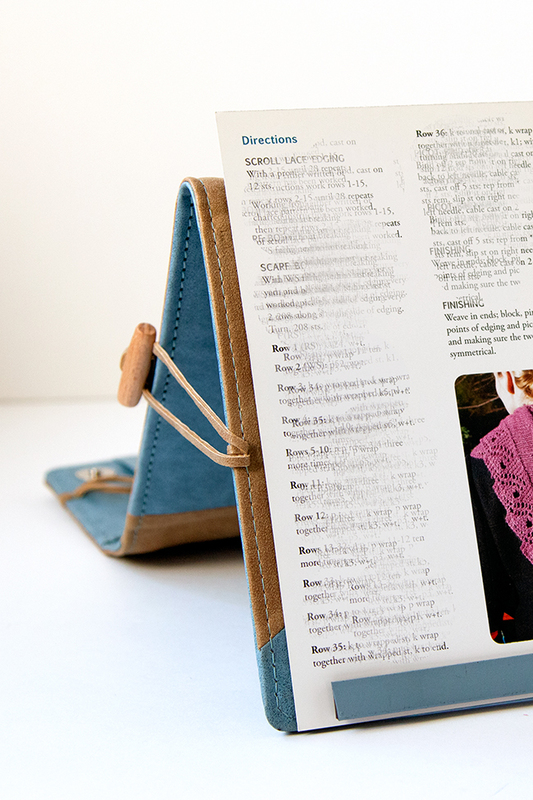 It has been intentionally obscured to protect the pattern author’s copyright. 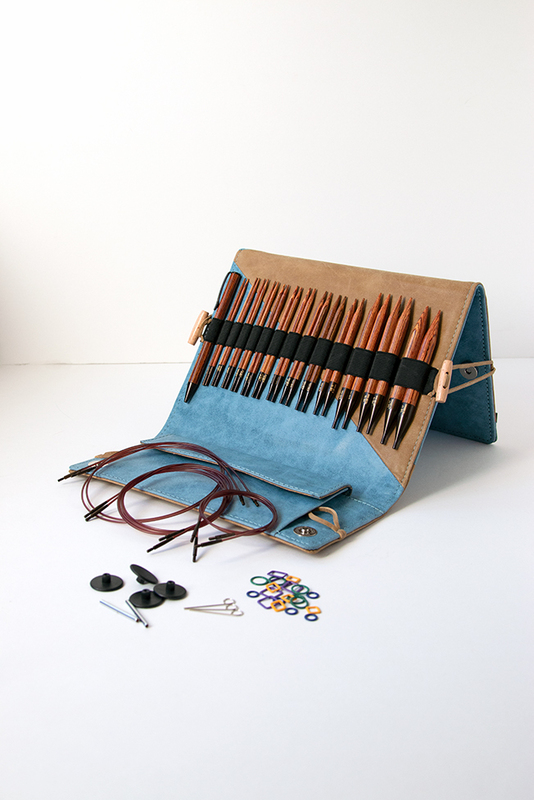 This is the most complete needle set I’ve ever worked with, and I love that it’s designed with multi-functionality in mind, beyond just the needle set. Needle tips are 5″ in length. 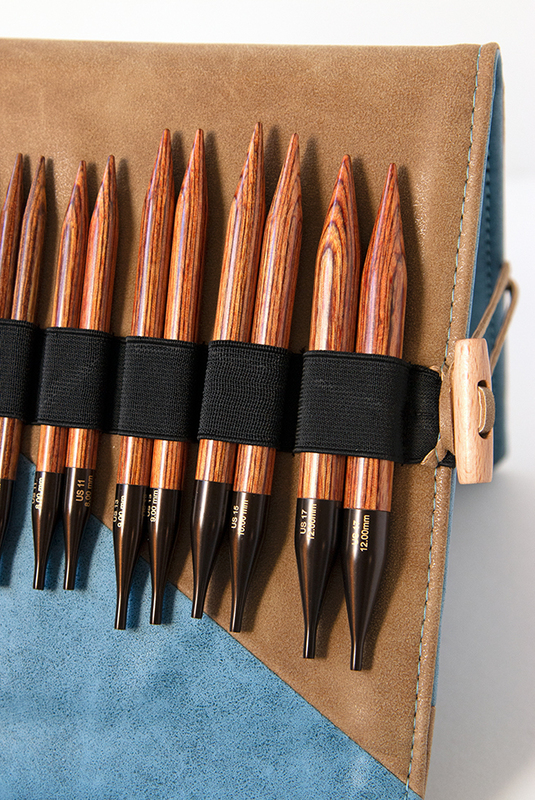 According to the packaging, the needles are made from ethically-sourced wood from sustainable forests. 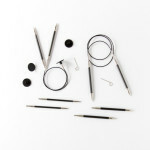 There are 13 sets of needle tips, ranging from US 3 (3.25 mm) to 17 (12 mm). Six cords are included: 2 sets each of 24″ (60 cm), 32″ (80 cm), & 40″ (100 cm). Cord connectors are included as well. Pattern/chart holder built into case with magnets included to hold your pattern and keep your place. Generous storage pocket for accessories. 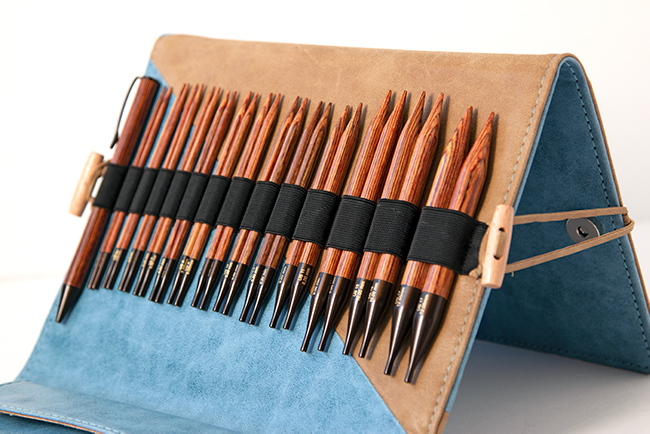 A pen that matches the needles is also built into the set. 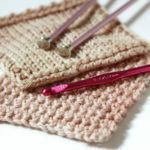 12 end-caps to keep your stitches straight, convert cords into holders, etc. 6 cord keys for joining cords & tips. 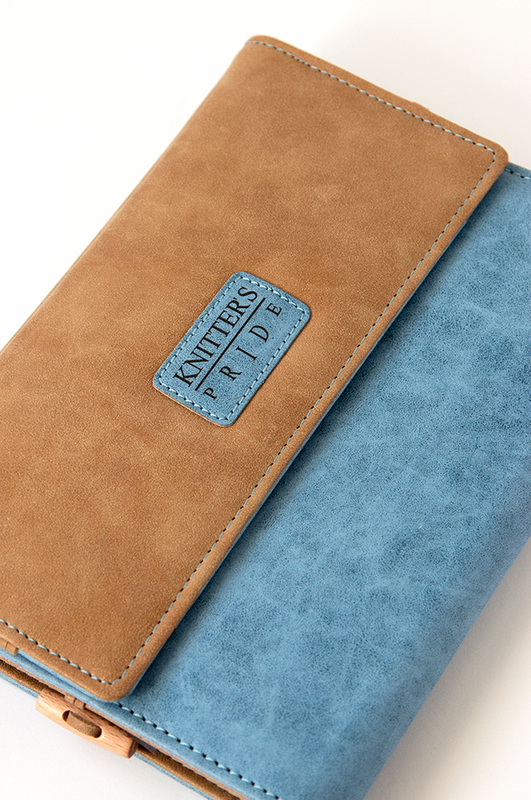 Comes in a pretty vegan leather case. 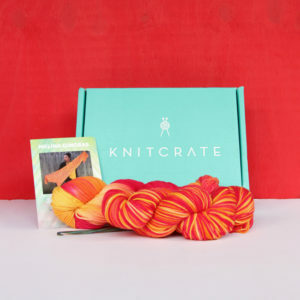 Just received this set and is my first experience with knitters pride needles. They are beautiful. 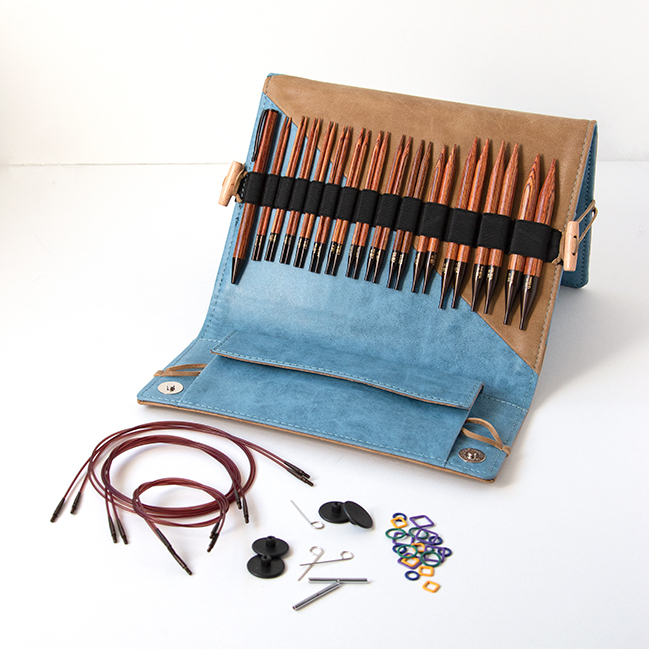 I have been knitting with Addi Clicks lace interchangeable needles. The addi cords label the length. I don’t see that knitters pride cords label their cords. How can you tell apart the cord length from each other? I like to use my measuring tape to confirm when I’m not sure. Often the packaging of the needle set mentions the lengths included. I hope you enjoy your new needles! How flexible are the cords? And are the tips fairly sharp? They’re similar in flexibility to Knitter’s Pride’s other cords – I can speak for the Karbonz cords as I have a set of those as well. They’re my personal favorite cords because, right out of the box, they’re usable without any need to break them in.